October is arriving so soon! Have you started thinking about Halloween costumes? 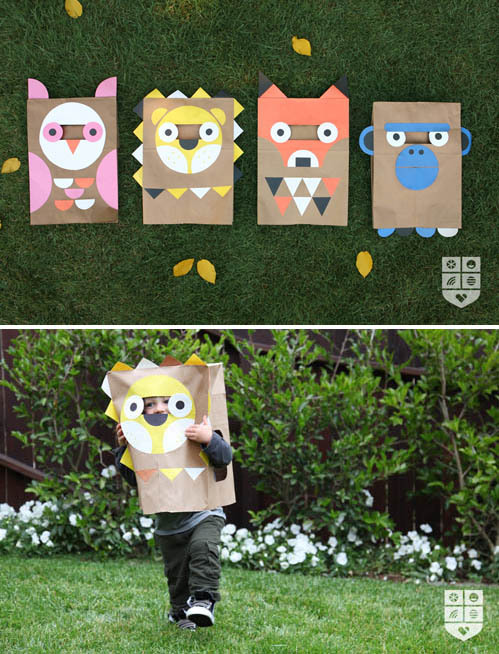 I saw this cute idea for paper bag animals created by Wee Alphas and thought I’d share. They’re adorable (I think the monkey is my favorite) and look like they’d be super easy to make. Plus: total bargain. If you’d like to try one, there are instructions + 4 designs you can download here. Does this kind of costume appeal to you? Or do you favor something more long-lasting? P.S. — Speaking of paper bags, a few years ago, Maude was The Paper Bag Princess for Halloween. I saw this on Pinterest and loved the fox costume. We’re making it today to test it out! These are adorable! I only wish we lived in an area where people would appreciate the simplicity and thoughtfulness of the design. I hate to say it but the creative community in this area is slim pickings. I don’t know if the old Florida country clubbers around us would get the cleverness of these. Oh my gosh – thank you this! Genius, inexpensive, and totally adorable! When I was at university, a senior asked me to a halloween party and while i dressed myself up as a princess in a big poofy gown, he showed up at my front door wearing a paper pag, with asymetrical holes cut out for the eyes and the inscription “YOU” in permanent marker on the front. Um, okay. It was a weird evening to say the least, he was an art major. Then at his senior art show that same paper bag sold, framed, for $600. I should have kept it. These look great fun Gabrielle and so easy and fun to make! Wishing my kids were a bit younger and we could have fun with this. Thanks for sharing. These are cute. When I was little, I found a HUGE paper bag that I think was meant to be used for garden waste. I went trick-or-treating as a lunchbag and my sister went as a unicef box! One of my favourite books as a child was The Paper Bag Princess so I dressed up as her a couple of years ago. It was my favourite costume ever!